We sometimes make mistakes to translate sentences literally from our native language to another one. This happens because we don’t use the same grammatical rules in Spanish and English. 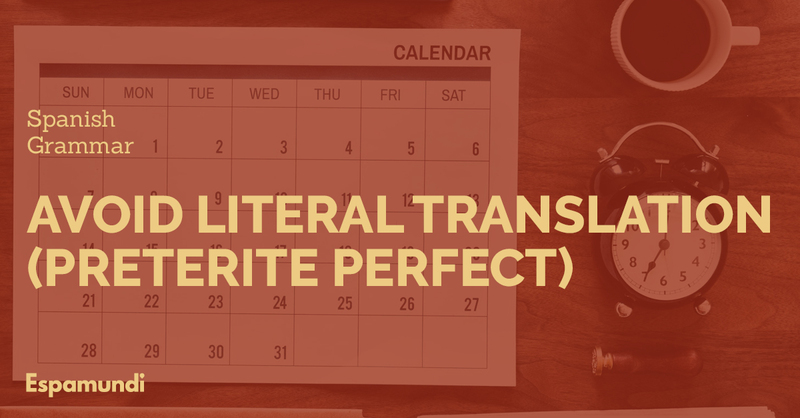 A common mistake English speakers usually make is that they use pretérito perfecto compuesto – preterite perfect or present perfect in English – instead of presente – present tense in English -. A literal translation can lead us to a misunderstanding. Let’s see this tricky situation with an example of how not to do it. This is an example of a literal translation from English to Spanish. Let’s say that I want to explain that I started to live in Málaga 5 years ago and I still live there. This translation is wrong because Spanish speakers don’t use this tense if the action still goes on. The Pretérito perfecto compuesto – preterite perfect or present perfect in English – is only used if the action has already finished. If I translate literally from English – using the pretérito perfecto compuesto -, my Spanish friends will think I’m not living in Málaga anymore! What is the right way? We need to use the PRESENT TENSE. In order to explain actions that started in the past and are carried on in the present, we need the present tense. It is also used to express how long we have been doing something that we still carry on doing. In conclusion, if you want to express how long you have been doing something, don’t do a literal translation from English. Use the present tense using one of the two ways showed before.